SAYBROOK - The St. John Heralds boys’ basketball team won their first tournament game in over a decade against the visiting Chalker Wildcats. The Heralds overcame an 8-0 run by Chalker in the first quarter to win 59-51. St. John was able to trim the deficit to 10-9 heading into the second quarter. David DiSalvatore helped the Heralds build momentum after a slow start with a pair of three-pointers in the opening quarter. 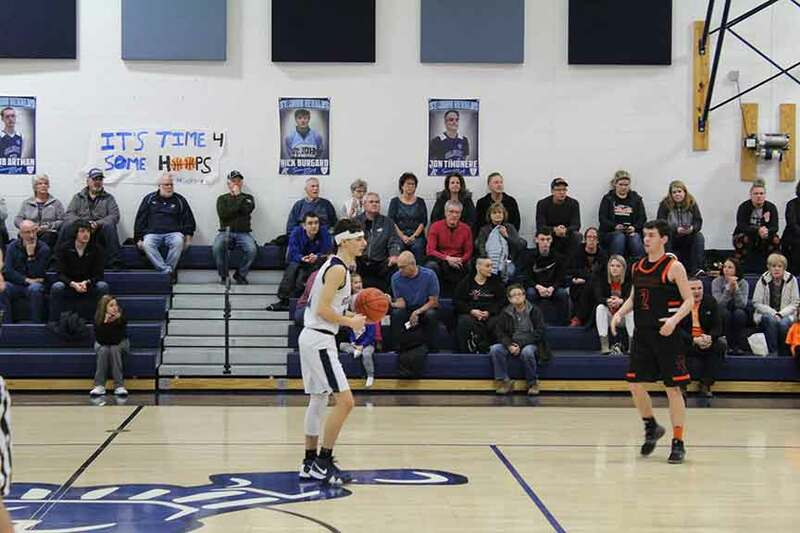 John Castrilla added jumper in the lane and Jake Artman hit a free throw. Chalker would push the lead back up to 28-22 heading into halftime by outscoring St. John 18-13 in the second quarter. The Heralds would turn things around for good starting in the third quarter as they doubled up the Wildcats 18-9. The nine point swing gave the Heralds a 40-37 lead going into halftime. St. John had another big quarter in the fourth as they outscored Chalker 19-14 for the 59-51 win. Jake Artman scored nine of his 19 points in the final quarter for the Heralds. The Heralds also received big three-pointers from Jon Chambers and John Castrilla in the fourth quarter to help seal the win. The Heralds also received double digit scoring from David DiSalvatore with 11 points and ten points from Johnny Castrilla. Rounding out the scoring for St. John were: Jon Chambers eight points, Jon Timonere six points, Dave Fuentes three points and Ryan Bento two points. Kyle Caracanas led the Wildcats with 18 points. Aiden Ricks was the only other Chalker play in double digits with 11 points. Rounding out the scoring for Chalker were: Trystan Mollohan eight points, Jordan Kellar eight points and Dylan Dye six points. With the win the Heralds advanced to play number one seed Badger in the Division IV sectional final. Pictured: John Castrilla dribbles the ball up the court for the St. John Heralds during a game against Chalker.